In order to work out the system for uploading and formatting patterns onto Ravelry I decided to start with launching a free pattern. 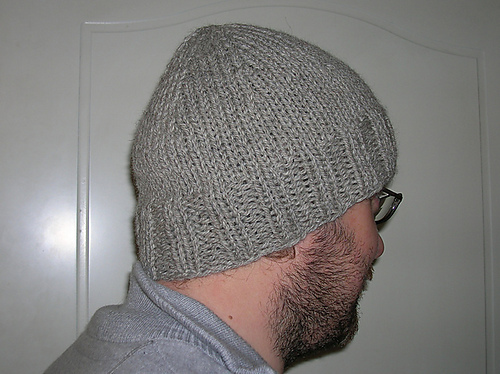 Fieldwork is a very simple, one-skein hat that I drew up when the BF asked for a new winter hat. Since he spends some of his time tramping about in fields – it seemed best to create a hard-wearing, smart (in case he has to talk to people) and – most importantly – cosy hat. It uses the wonderfully sheepy Rowan Purelife British Breeds Chunky which knits up incredibly quickly. For the Ravelry pattern page click here and for the pattern itself click here. Tags: design, free, hat, NaBloPoMo | Permalink.